Lisa Reinicke is the majority holder of Our House Publications and author of 4 published children’s picture books for sale on Amazon and independent bookstores. Lisa has been showered with awards including, the 2017 Mom's Choice Gold Award for lifetime literary excellence for her children's book Wings and Feet, the 2018 Book Excellence Award & 2018 Reader's Favorite Gold Award for Wings and Feet, 2018 Book Excellence Finalist for her book Football Flyboy, 2018 Honorable Mention in the Story Monster Purple Dragon Awards in several categories for Wings and Feet and Bart's Escape out the Gate, and 5 star review from Reader's Favorites on all her books. She is a storyteller and author of 35 children’s stories appearing on local TV shows, elementary schools, and bookstores. The stories have been published in 3 collective recordings for distribution for A Goodnight Sleep Company. She also produced online (virtual) training for service advisors and technicians. Lisa serves as head writer and on-camera talent in the videos. Her books are entertaining yet focus on social issues that engage children and parents to discuss. Her four children were all uniquely different ranging from physical differences, adoption, and physiological disorders that lead her following experts in each field to help children overcome the stigma around being different. Lisa passionately works raising money for charities that improve children’s lives physically, emotionally, and spiritually, as well as charities who support veterans and historical artifacts (particularly during the WWII era). 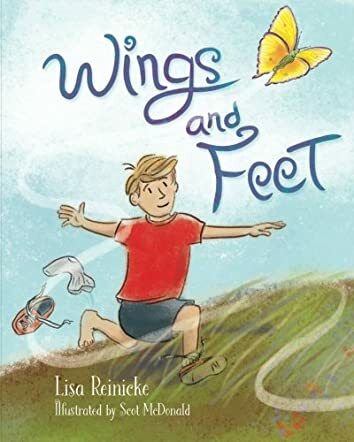 Wings and Feet by author Lisa Reinicke and illustrator Scot McDonald is a children's book that focuses on the friendship of a boy and a butterfly. It has a delightful rhyming quality, hitting you at all levels of emotion, from happy, to anxious, to a touching ending. The illustrations on every page are simple in style, but have a wonderful core of perfection to them. There are warm tones in areas and then there is one area that is darker, that really pops out at you, and nearly takes you into a whole other world in itself. I don't know if this will be true of everyone, but I burst into tears at the end of Lisa Reinicke's Wings and Feet. I'm not sure how a short children's book was able to bring me to tears so quickly, but it was definitely a cathartic experience. The circle of life was touched upon, and I'm a lover of all creatures great and small, so maybe that's why. I remember helping caterpillars into trees so that they wouldn't get squashed on the driveway. There was something about this book that made me think of The Last Unicorn and of The Land Before Time, but I don't want to give everything away about it. You'll have to find out for yourself just how heartwarming it is. This book is perfect for children. They will be delighted by Scot McDonald's illustrations and will hopefully understand the message inside this book, which is plainly understandable. Depending on their age, it might be something that an adult needs to explain to them. It was one of the best children's books I've ever read. Your little one will want you to read it night after night.